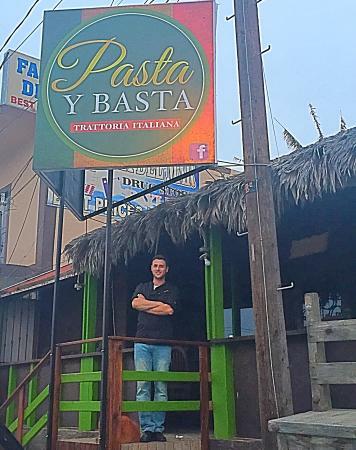 Rosarito's Pasta y Basta Trattoria Italiana nominated for the nation's 100 "must" experiences 2016. Chef Christian Gritti was born and raised in Bergamo, Italy. He attended one of Italy's most long standing culinary schools in San Pellegrino, Italy. His family has owned restaurants in Italy since 1896, making him the fifth generation in his family to carry on the tradition of preparing food for people. The chef has worked at a variety of Italian restaurants in Northern Italy from his hometown all the way to the Italian Riviera. The Italian Riviera is where he mastered the art of making pansotti & pesto. One of the most famous restaurants he worked at was a one star Michelin called Restaurante Lo Ro. The chef enjoys creating dishes that give the palate a full sensation of elements such as mixing sweet with salty flavor & soft with crunchy qualities. 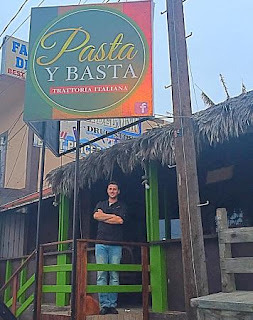 He is a traditional Northern Italian Chef, but as he resided and worked in Rosarito, he has begun to fuse some Mexican local ingredients into his cuisine. He enjoys working with seafood, and especially enjoys working in front of the people he cooks for to show the fresh ingredients he uses, because he believes that people should know where their food comes from! All of the pastas are handmade fresh! At our trattoria we do a traditional Italian menu of four courses; an antipasti (appetizer), primi (pasta or risotto dish), secondi (meat or seafood dish), and dolci (dessert). You will always be offered the chef's own Limoncello after every meal because it is an Italian custom! How does a trattoria differ from a ristorante? A trattoria, is less formal that a ristorante with casual service. It is an unpretentious, often rustic environment that makes traditional food mostly following regional and local recipes, and it is a perfect family setting. A trattoria also serves an ever changing seasonal menu, filled with local favorites like cheese, local made wine, and in the winter months, wild game. All you fans of Pasta y Basta, please show your support by clicking on the link below. Vote Daily to let folks know what we have to offer here in Baja California!